An ideal home piano with premium voices and built-in lesson mode. 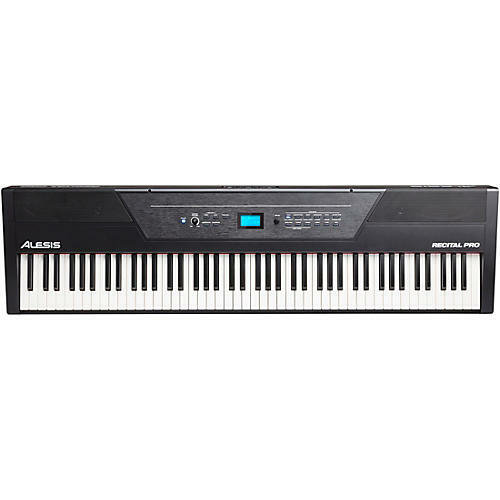 The Alesis Recital is a full-featured digital piano with 88 full-sized semi-weighted keys with adjustable touch response. The Recital features 5 realistic built-in voices: Acoustic Piano, Electric Piano, Organ, Synth, and Bass. Customize the voices by combining any two at once in Layer Mode for a full, rich tone. They can also be assigned to only the left or right hands in Split Mode. You can even add adjustable Reverb and Chorus to further tailor your sound. With powerful 20-watt built-in speakers and a 128-note maximum note polyphony, Recital delivers ultra-realistic sound with great playing experience. The Alesis Recital has an incredibly useful feature called "Lesson Mode." This feature divides the 88 keys into two zones with the same pitch and voice. This enables both the student and teacher to easily watch each other and play together without having to take turns or reach over one another. Recital also features a 1/4” (6.35mm) headphone output which mutes the internal speakers for convenient, quiet private practice. In addition to the 1/4” (6.35mm) sustain pedal input (pedal not included) and the 1/4” (6.35mm) stereo headphone output, Recital also features stereo RCA outputs to connect to a recorder, mixer, amplifier or other sound system. Recital also features a USB-MIDI output for connecting to a computer and using educational software or virtual instrument plugins. Recital can be powered using the included power supply or by 6 D Cell batteries (not included). Premium piano, perfect for practice. Order the Alesis Recital today!